I love me. Though now that Oprah's off the air, I know I'll need a little boost now and then to remind me of how much I love me. Fortunately, I've got my stereo loaded with Putumayo's new compilation Rumba, Mambo, Cha Cha Chá. Music that, as a friend put it, makes you want to flirt with yourself. On Rumba, Mambo, Cha Cha Chá, Putumayo explores retro-flavored Latin dance music with these timeless genres from the Cuban family tree. Rumba, mambo and cha cha chá are familiar names to ballroom dancers the world over. Originating in Cuba from a blend of African and European influences, they have become immensely popular around the globe. 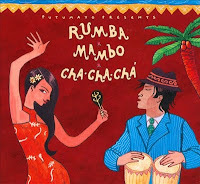 On this album, Putumayo has collected songs that demonstrate the universal appeal of these musical styles, with informative liner notes in English and Spanish accompanying the CD. Marseille-based Conjunto Massalia opens the album with "Guajira y Chachacha," a song about the birth of these two related genres. Cuban group Tradicuba’s "Potpourri de Cha Cha Cha" is a medley of some of the most memorable cha cha chá's in the history of this venerable style. Internationally celebrated Colombian band Fruko y Sus Tesos, whose Latin dance tunes are popular with salsa DJs around the globe, offer their own spin on a classic of the mambo repertoire, "Mambo #5." Salsa Celtica adds Celtic flavors to son and rumba rhythms on "Esperanza." Blending soulful Afro-Cuban percussion with elegant melodies on "Mi Chachacha," Orquesta La Moderna Tradición has earned accolades for preserving and updating the classic Cuban ballroom music style danzón, a forerunner of cha cha chá and mambo. Grammy Award nominated, Chicago-based Angel Meléndez and The 911 Mambo Orchestra perform the classic "Cereza Rosa" in a mambo-meets-cha cha chá style. Other featured artists on Rumba, Mambo, Cha Cha Chá include the Havana-based group Asere, who contribute “Oriente;” renowned Cuban flautist J. Joaquin Oliveros performing "Me Lo Dijó Adela"; ska and mambo-inspired Belgian group Internationals with "E.L.S. ;" and Russia’s Tres Muchachos & Companeros covering Jimmy Bosch’s "Pa' Mantener Tradición." That this music has spread globally is attested by the origins of the included artists: Cuba, yes, also France, Colombia, Scotland, the USA, Belgium, and Russia. The whole compilation makes me nostalgic for a time I never knew, for dancing in a sweaty but polite hall on a palm-lined street as the sun sets across a sandy beach. Put on this track, and have a dance with yourself. You'll hardly miss Oprah at all.